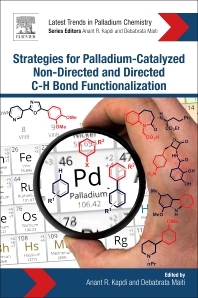 Strategies for Palladium-Catalyzed Non-directed and Directed C-H Bond Functionalization portrays the complete scope of these two aspects of C-H bond functionalization in a single volume for the first time. Featured topics include the influence of palladacyclic systems in C-H bond functionalization (need for newer catalytic systems for better efficiency), mechanistic aspect of the functionalization strategies leading to better systems, and applications of these methodologies to natural product synthesis and material synthesis. Anant Kapdi studied chemistry at the University of Mumbai (MSc 2002) and York (MSc 2005; Dr. Ian J. S. Fairlamb). He completed his PhD in 2008 under the supervision of Dr. Fairlamb at York University, before starting postdoctoral work in the research group of Prof. Lutz Ackermann at the Georg-August-University Gottingen as an Alexander von Humboldt fellow. He returned to India in 2010 and was appointed as DST-SERC Fast Track Fellow (2011) and DST Inspire Faculty (2012) at the Institute of Chemical Technology before taking up UGC-FRP Assistant Professor position (2013). He has been a recipient of Alexander von Humboldt equipment grant as well as research cooperation grant. Recently, he was selected as the Young Associate of Maharashtra Academy of Sciences. The unifying theme of his research program is the development of Sustainable catalytic solutions for challenging synthetic problems. Debabrata Maiti received his M.Sc. from the Indian Institute of Technology, Bombay, in 2003, and his Ph.D. from Johns Hopkins University in 2008. He has taught at IIT Bombay since December 2010 and has been the recipient of several awards, including the NASI- Young Scientist Platinum Jubilee Award (2013), IAS-Young Associate (2013), IIT Bombay-IRCC Young Scientist Award (2013), Thieme Chemistry Journal Award (2013), CRSI Young Scientist Award (2014), AVRA Young Scientist Award (2014), ISCB Young Scientist Award (2014), and INSA-Young Scientist Award (2014). His research interests include Development of Transition-Metal Mediated Reactions and Bioinspired Catalysis.